X Factor is brash and even vulgar. It plays on the emotions. Outside of the panel and their own ‘games’ with each other to make good ‘tele’ you have a pumped up audience that contains a seeming endless supply of artist family friends who take no nonsense from panel members if by chance their ‘beloved’ comes in for negative comments. They must spend weeks in preparation so that they can with alacrity scream and shout, hiss and boo when their supposed star in the making is even said to be out of tune or a beat behind the backing track. The artists either beam or look distraught at comments that come their way. A few wise among them sensing armageddon is heading their way realise the ‘way out to be way in’ rests in thanking ever so much panel members for their comments. and that with these helpful negatives why next time they will be sensational. The artist show deep friendship to each other when things get a little hectic, as one of them must vacate a chair that previously meant acceptance for another - the camera catches deep pain and sometimes the unsaid expression that suggests the thought: “what is ‘he’ doing? (Simon Cowell).I’m great. “ But yes, all part of the show-biz structure that attracts millions, and some people’s desperate attempt to find their life fulfilment as a star. That said there are some impressive singers and groups. He does a delightful version of the Wayne Drain worship song ‘Dancing with the Father.’ O hear hi guitar technique then turn to track eleven’0nly Believe.’ And from time to time there are infectious vocal back-ups from the likes of Michelle John and Mel Pope. Soul Survivor issue Love Takes Over that features Beth Croft, Tom Smith, Tim Hughes and Rend Collective.. Since what I’m sent doesn’t play I cannot comment, but I mention because it is release waited for by many. the track ‘Singularity’ should remind of old times. You need to inject some Christian reflection but you have a great starter. And of course Joy Division with the suicide of lead singer Ian Curtis brings another dimension into the theme of ‘’why do so many, die young’ in artistic and related fields. NAME THE SONGS IN WHICH THESE LINES OCCUR. 1 Moonlight sleeping on a midnight lake. 2 Sharing a park bench quietly? 3 I can’t help it. I wonder what’s gone wrong. 6 He turned on the gas and he went to sleep. 9 She said, “A bad days when I lie in bed. 1956: The Year that Changed Britain by Francis Beckett and Tony Russell. 1966: The Year the Decade Exploded by Jon Savage (Faber). Author David Cavanagh has produced an extraordinary 620 page book that both outlines and comments on endless Peel programmes that fell beneath the titles of he Perfumed Garden, Top Gear, and much more than the others The John Peel Show. So we get play lists, and comment, and we receive notes on how the nation was faring at the time. It’s a ‘dip’ text – fascinating and commendatory. Essential for any collector, yet very readable in its entertaining style to anyone who lived through times when Peel was ‘the’ man who brought us great music. Along with his brilliant and knowledgeable producer (who deserves much more praise than the few lines in this book) John Walters, JP programmed many an artist and band who eventually became big time, although again paradoxically, he never liked the world of fame to which they would elevate. At the same time, and more important, he gave airtime to the small outfit who in many respects had no ‘pluggers’ and record company finance to push their cause. That of course did mean that at times he played the not very good, but yet. Some 300 broadcast details between 1967 and 2004 find space. Sees a brief dissertation on ‘Christian’ England, and the reverential air of a Sunday a long time back. Into the tranquil of course came Peel and the day became lighter. I feel Peel might wince and give a wry smile to the claims of the sub-title but undoubtedly he affected many in musical taste and life itself. But from personal experience I know that in the team of Radio One there were others who programmed other kinds of music such as hard rock or Philly and even pure pop, who enthused, and whose choice brought joy to our lives, and so to could claim to exercise influence. Among these there was the Methodist, Tim Blackmore, and he would become an executive producer at Radio One. That said, Peel is well served by Cavanagh and the book is a worthy piece of work and publication. 1 Homeless 2 0ld Friends 3 American Tune 4 Silent Eyes 5 I am a Rock 6 Most Peculiar Man 7 THE Boxer 8 Me and Julio 9 Slip Slidin’ Away 10 You can call me Al. our head of sales, Ms Clarity Morale. MS MORAL: No ‘e’. It’s Moral, English not French. JASPER: Jolly good. Well now, as your Chair I can assure you shareholders that we are having a bumper Christmas – we kicked off in August with our Christmas celebrations, aimed at our American visitors who like to store away something British and eventually give to their friends during the festive season. Nothing better than something from Britain. This is a time of giving. SIR ARCHIBALD. Above all giving. MS MORAL : Thank you Sir Archibald. Shareholders. As you well know in a world of scams we bring honesty at the till. It’s not been easy keeping quality and price levels and profit margins running smoothly. There are ways of course to achieve what we want without the consumer noticing. Not that we do. MS MORAL Our celebrated chocolate biscuits have less fingers but more air. SIR ARCHBALD” we take health warnings seriously. MS MORAL. Indeed. I’m so glad you have mentioned that. We are committed to ensuring the consumer is fully aware of any health challenges. So our frozen pizzas carry a calorie count, based on someone eating a` quarter. For Christmas, we have numerous gift sets. We tell the consumer of the advantages in purchasing a number of items that come in a most attractive box. MISS MORAL: Not so, of course, but they do get a lovely box. It’s the same with our hampers, but again you get a lovely box. SIR ARCHIBALD: For another 20% added on. Most reasonable. MISS MORAL Not everyone intakes alcohol at Christmas, and so we are putting out a range of smoothies for the festive period. Our strawberry juice is already selling in dozens of our stores. Of course it is mostly apple juice – we have squeezed two strawberries into each bottle and that produces the look. SIR ARCHIBALD: Ms Morales, no MS Moral is driving our profits ever higher. LINDA: Words are most important on our packaging. NEW is a powerful selling word. We can use the word even if we are just changing the colour. It’s always good for sales to say ‘Now with’ as though extra quality is being added, it may be just adding something that Is irrelevant. Exclamation marks are important, the more the urgency the greater the response. People think the product is selling fast and they had better get along and purchase. ‘Savour every moment’ – it gives the feel of something that will last in effect. MISS MORAL: Often we simply say ‘Special’ or Recommended” You don’t have to say who is recommending, Costs too much to find a star name. I like words ‘delicious’ ‘sumptuous’ ‘mouth watering’ or ‘we have created’ – that one suggests to the buyer that extra time and effort has gone into whatever. Something special. To that you can add ‘only available for ten days. SIR ARCHIBALD: Don’t ever put a date of start. “Rude not to pay at that price’ or ‘Simply as it should be’ – that makes people feel that in the past other concerns have cheated on them but now comes the real. Oh ‘Award winning’ you don’t have to say where, it can be simply any group that makes an award. Set one up if need be! And if there was a big award, sometime or the other, you don’t have to say that it was say in 2007 – it’s an Award. SIR ARCHIBALD” Jolly good is all I can say. Just one last thing we are co-operating much more with churches. M MORAL: For a small fee hundreds of churches will say that we are sponsoring their service. Or we are sponsoring a hymn. Or I have this idea that the three kings could bring gifts from our store, I said to the clergy gathering I addressed yesterday, that it’s bringing something modern into the story. I’m writing this as we come close to the first Sunday in Advent, November 29th. 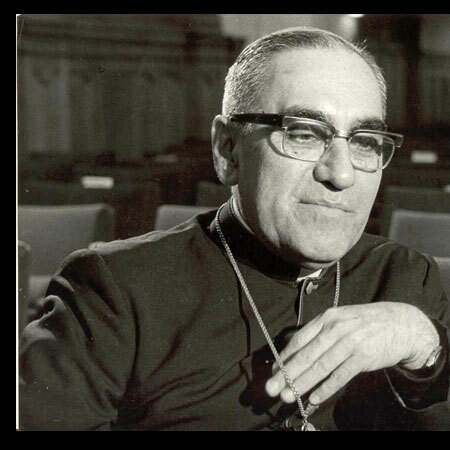 Nobody knows exactly how Advent started but around the 5th century it was decreed a time of fasting. It was pushed earlier, to St Martin’s Day on November 11th because St Martin Bishop of Tours was committed to the poor. This rather long Advent was known as St Martin’s Lent, a second period of penance and fasting which lead up to Christmas - not such a dominant aspect of Advent today! Indeed suggest that to the major stores as a good run up to Christmas and one can imagine pretty solid resistance! I love Advent with its sense of the new church year beginning, and beginning by pointing to the birth of Jesus in Bethlehem. 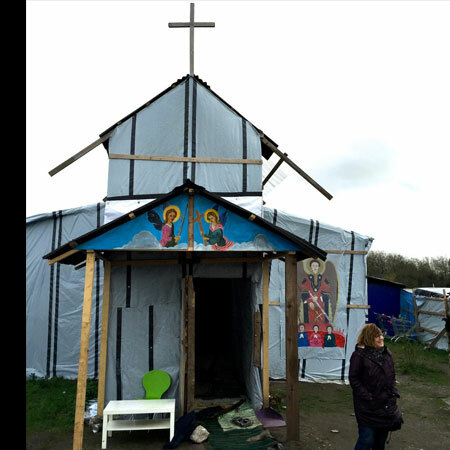 So as we walk forward through Advent let’s do it with the generosity of God, seeing the face of Christ in those we meet and especially in the refugees for whom there will be very little room at the inn this Christmas. I have a lovely version of Sufjan Stevens singing ‘Once in Royal David’s City’ and he changes one word in the second verse - with the poor, oppressed and lowly lived on earth our Saviour holy. Instead of the word ‘mean’ as we often sing it, he uses the word ‘oppressed’ which brings the sentence alive. I’ve since discovered this is the wording of the hymn in the Presbyterian hymnbook of America. …and still lives beside those who are poor and oppressed. And so - for those of us who would consider ourselves as members of Christ’s community of love, may we feel the challenge in Advent and Christmas of those who get forgotten. And that is the message of Christmas Eve. 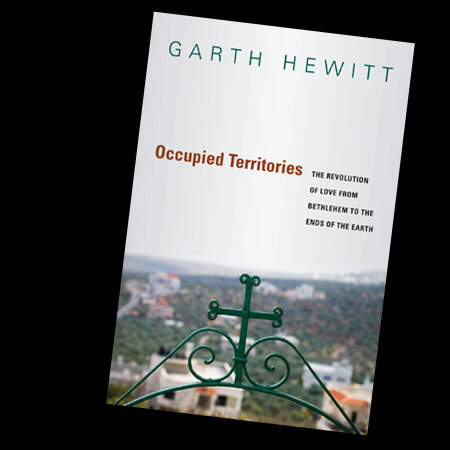 Garth explores the thoughts in this newsletter in depth in his book Occupied Territories, The Revolution of Love from Bethlehem to the Ends of the Earth, where he has coined the phrase 'Bethlehem theology'.